Two Celtic players and one each from Aberdeen and Dundee are in the running for PFA Scotland's Scottish Premiership player of the year award. 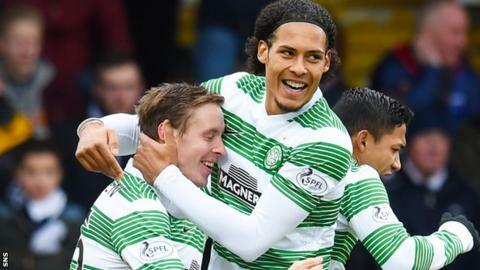 Dutch defender Virgil van Dijk and Norway midfielder Stefan Johansen have helped Celtic lift the Scottish League Cup and lead the Premiership. Irish striker Adam Rooney's 27 goals in all competitions have underpinned second-placed Aberdeen's strong season. Dundee striker Greg Stewart is the sole Scot on the list after scoring 15. It is the 25-year-old's first season in the top flight after leaving Cowdenbeath last summer and Stewart's side sit sixth after winning the Championship last summer. The shortlist is made up of the four players who lead the voting among their fellow professionals, members of the Professional Footballers' Association. The award was won by Celtic midfielder Kris Commons last season and two of his team-mates are in the running to succeed him on 3 May. Van Dijk joined Celtic for £2.6m from Groningen in 2013 and the 23-year-old has contributed 10 goals in 54 appearances this season, including two spectacular free-kicks in the reigning champions' last two games. Johansen, 24, moved to Celtic for £2m from Stromsgodset in January 2014 and has scored 12 goals from his 52 games. Rooney, who had a previous spell in Scottish football with Inverness Caledonian Thistle, joined Aberdeen on loan from Oldham Athletic in January 2014 before making the move permanent last summer. The 27-year-old, who has also played for Stoke City, Yeovil Town, Chesterfield, Bury, Birmingham City and Swindon Town, has made 43 appearances this term. Jason Denayer, who is on loan to Celtic from Manchester City, has been named on the shortlist for young player of the year. The Belgium defender is joined on the shortlist by Inverness Caledonian Thistle midfielder Ryan Christie and Hearts midfielders Sam Nicholson and Jamie Walker. Meanwhile, champions Hearts have three nominees - defender Alim Ozturk, midfielder Morgaro Gomis and forward Jamie Walker - in the running for the Championship award. Hibernian midfielder Scott Allan is the other man on the shortlist. The League One award is between Stranraer winger Willie Gibson, striker Declan McManus, who is on loan to Greenock Morton from Aberdeen, Peterhead midfielder Jamie Stevenson and Brechin City midfileder Alan Trouten. In League Two, Arbroath have two nominees - Bobby Linn and fellow forward Simon Murray, who has loaned back to the Red Lichties after joining Dundee United. The others in the running are Elgin City striker Shane Sutherland and Queen's Park midfielder Paul Woods.